Boston Cafes Launch Shared DISloyalty Card! | Small Farmers. Big Change. 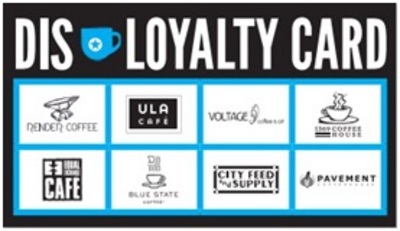 Boston Cafes Launch Shared DISloyalty Card! Coffee lovers now rewarded for being disloyal. BOSTON/CAMBRIDGE, Massachusetts – Dec. 7, 2011 – Coffee slingers of Boston are uniting to celebrate the city’s incredible café landscape and the art of brewing up high-quality artisanal coffee. This winter, eight independently owned cafés are joining together to launch Boston’s first disloyalty card program. It’s similar to a customer loyalty card, except that customers are encouraged to visit other businesses. The idea is to build support for local, independent shops in a city dominated by national coffee chains and to inspire coffee enthusiasts to explore Boston’s growing coffee culture. The initiative came out of discussions between managers at Equal Exchange Café and City Feed & Supply in Jamaica Plain. “We get to share our excitement about Boston’s burgeoning coffee scene with our customers – and hopefully, serve up a pleasant surprise for some folks who don’t yet know our shop,” said Sam Archer, manager at City Feed & Supply’s Boylston Street location. Here’s how it works. Starting on Dec. 15, 2011, the eight cafés will begin distributing disloyalty cards to their customers. The customers will have until March 15, 2012, to receive a stamp from each of the cafés when they purchase a drink. After the card is complete, they can redeem it for a free drink at any of the participating cafés. The disloyalty card concept was first launched in London by Gwilym Davies, the 2009 World Barista Champion. Similar programs have popped up in the U.S., in Seattle and San Francisco. Rawson-Ahern said the initiative to launch a disloyalty program here in Boston has had overwhelming support and enthusiasm. “We’re excited and proud to be joining up with other independent cafés – it feels like we are all part of a community.” said Andrew LoPilato, general manager at Pavement in Boston. 66A BOYLSTON ST. & 672 CENTRE ST.